A lot of product ranges have been launched these past years that claim to be "Ayurvedic" or based on the principles of Ayurveda, the 5.000 years old East Indian science of health and medicine. One example would be Taaj, which I have recently seen popping up and there in beauty videos and blogs. The reason I never gave these product a closer look is that I always felt they were more complicated than usual skincare ranges, and that I didn't know whom to turn to for information and explanations. Believe it or not, the SA's in my local pharmacies aren't too well informed about Ayurveda either. So when I was approached by the PR of Canadian Ayurvedic brand Pure+Simple, and they offered to send me the book explaining their phylosophy, I had an "aha" moment: finally I was going to get some explanation! The author, Kristen Ma, is the co-owner of Pure + Simple Inc., a group of holistic spas with its own line of natural skincare and mineral make-up. She is an Ayurvedic Practitioner and Esthetician who actually went through quite a lot of skin issues herself (acne and all that jazz) and who tried lots of things before turning to Ayurveda and realising that her problems had been treated the wrong way all along by our occidental medicine. So she definitely has experience in what results an Ayurvedic approach can get with skin issues. I'll try to explain the basics in short. Our body is animated by 3 types of energies called Doshas. These are: Vata (air), Pitta (fire) and Kapha (water and earth). The three Doshas should be balanced but we are all dominated by one main Dosha (sometimes two). This will determine our hair and skin profile - as well as, on a deeper level, our health in general. Vata profiles have thinner hair and dry skin, Kapha have oilier skin and beautiful thicker hair. Pitta profiles, which I am, often have fair sensitive skin and thin but smooth hair that can become grey at an early age. Obviously, the three profiles will have different skin issues to address, and will benefit from different kind of skincare products. The aim is to re-balance the Doshas to solve the problems. There is, of course, a test at the beginning of the book so you can determine which Dosha you are. Then, there is extensive explanation of what this profile means in terms of skincare and haircare, but also the kind of health issues your Dosha is more prone to encountering. After that, the author addresses a lot of different skin issues such as acne, eczema, rosacea, hyperpigmentation, ageing signs... and how to treat them. I really enjoyed reading the book and learning about the basics of Ayurvedic principles - without getting too much in depth and getting medical either. I recently came across some books about beauty and detox, and as I was reading them, I was really thinking that it was just a bunch of crap and I couldn't buy into it. With this book, I felt I could relate to what was explained, and for me, things felt logical and totally made sense. I also enjoy that the book can be read even if you don't use the Pure+Simple skincare range: this is definitely NOT pushing the range or selling it as the only solution to your skin problems. The book is REALLY about Ayurvedic skincare in general, and I enjoyed that very much. 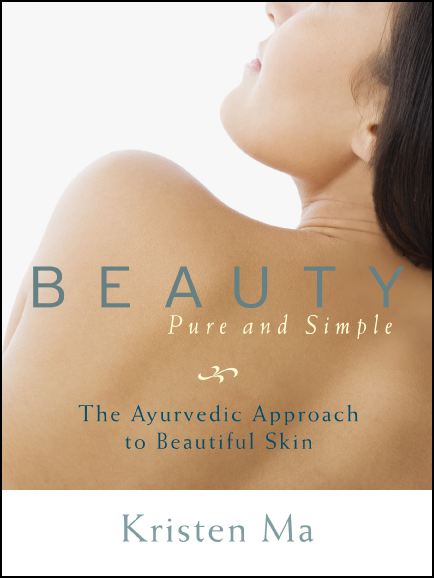 Bottom line: if you're interested in an alternate vision of beauty and skincare, or are curious about the Ayurvedic ranges that are appearing on the market, this book is what you need. It's available on Amazon. After I read the book I was offered a few products by Pure+Simple. These are made of natural ingredients and free of chemical crap, to put it in a nutshell :) I am currently trying them and will report on my experience when I've used them for a while. Thank you for this review, I have to take a look, so much fun! I think I am Pitta or Vata, can't decide, hm. I really like natural brands but sadly most of them don't work for me, I yet have to learn and figure out more to be sure why it is like that. Fingers crossed so far I have had no issue with REN nor with PURE+SIMPLE products! That's what I thought (essential oils), I can use REN without any problems as well (I have their rose serum), I have to check out pure+simple. I was hoping I could replace some of my skincare products with natural brands, never would have thought this would be such a challenge. With the mushrooming of day spas, medispas, Ayurveda centers, and Ayurvedic healthcare retreats, both in India and abroad, the age old principles and techniques of Ayurveda are becoming much more accessible to the common man and thus, gaining prominence the world over.